I have spent a good bit of my adult life playing music, learning music, and creating music. I dabble around with a lot of musical instruments. But a drum kit? That, by far, has stolen my heart. My parents bought my first real kit when I was 8 years old. Before that, I made myself an incredible kit out of pots and pans. (Pro tip: Aluminum pie crust pans make incredible cymbals.) Something undeniable stirred inside me every single time I would sit down, turn up some country music, and grab a pair of hickory drum sticks. I have always viewed playing drums as if I'm the carpet everything else sits on. I developed a love of rhythm that, to this day, I can't put into words for people. Rhythm and timing surrounds you. It's in your heart beat, your breaths, the blinker in your car, the sound of high heels, ocean waves, a hammer driving a nail. As I grew and matured as a drummer over the years, the Lord taught me a few things about playing worship music. One of the easiest pits to fall into is thinking, "You are just the drummer." That couldn't be farther from the truth. 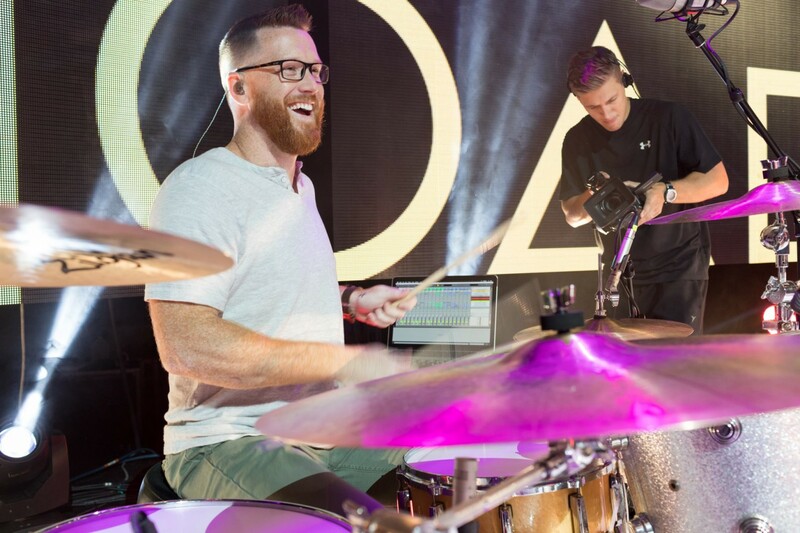 In a worship set, the drummer is the largest portion of the band, delivering dynamics, creating emotion, and creating rhythmic movement. You're one of the main worship leaders. The more you can shift the focus away from you, the easier it is to step into true worship. I have always viewed playing drums as if I'm the carpet everything else sits on. Think about it: When is the last time you walked into a room and really said, "OMG! I love the carpet in here!" Now, I'm sure that has happened before, but not every single time you walk into a room. The opposite, however, is true. You would notice a room without the carpet. Or, you would notice if the carpet was dirty, unsafe, or if it was ripped out from under you. For worship music, the carpet isn't the foundation. The foundation is below the flooring. The foundation is Jesus. The carpet is simply a safe and inviting space for others to sit on. The best worship drummers are the ones who provide a solid, clean, distraction-free space for the rest of the band and vocalist to sit on. This allows more unity and attention to be projected to Jesus from the stage. You have so much power as the drummer — power to flip the energy, tempo, and emotion in a room. The entire reason you are on stage as a worship leader is to focus everyone's attention on someone else. If you have no clue of how to use that power (and be obedient to God in it), you will never tap into the full potential of your musical gifting. To play well, you must have one ear listening to the band and, at the same time, an ear open to God. Learning to play this way takes some time. I don't really have any technical advice for "playing like you're a carpet." It really is a mental and spiritual thing. The entire reason you are on stage as a worship leader is to focus everyone's attention on someone else — Jesus. So, the more you can shift the focus away from you, the easier it is to step into true worship.